Amplified Ampharos! Pokemon One a Day, Series 2! 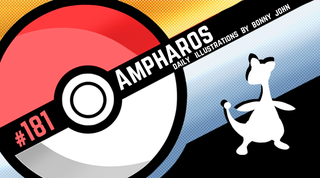 Ampharos is a Pokemon beloved by many. I am unfortunately, not part of that camp. That aside, I know there are probably many looking forward to the creature and I wanted to deliver something they'd enjoy. It took a while to try and find an angle I'd like and I found it as the end result is a piece that tops off it's evolutionary line in an electrifying way. The last explosive design was that of Typhlosion, a Pokemon quick to anger with the makings of a volcano erupting. 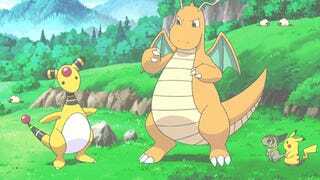 Ampharos on the other hand looks really gentle but keeps a (dumb) hidden secret - it's got dragon genes in there somewhere. Yep, this weirdo up right sheep kangaroo with flippers becomes part dragon type when it mega evolves! As an electric type, I thought to let loose bolts of electricity between rabid lines and paint splatters. Electricity is a strong and rapid current of power that is hard to tame unless you've got the right handle. I wanted to put that on display with Ampharos as something more paint based had no been explored in series 2 yet. The effects were simple to get to - I had premade brushes with varying splattery shapes and I used duplicate layers for colors and of Ampharos and pushed them through many photoshop filters. It was more or less a very Pollock-y approach to creating I think!